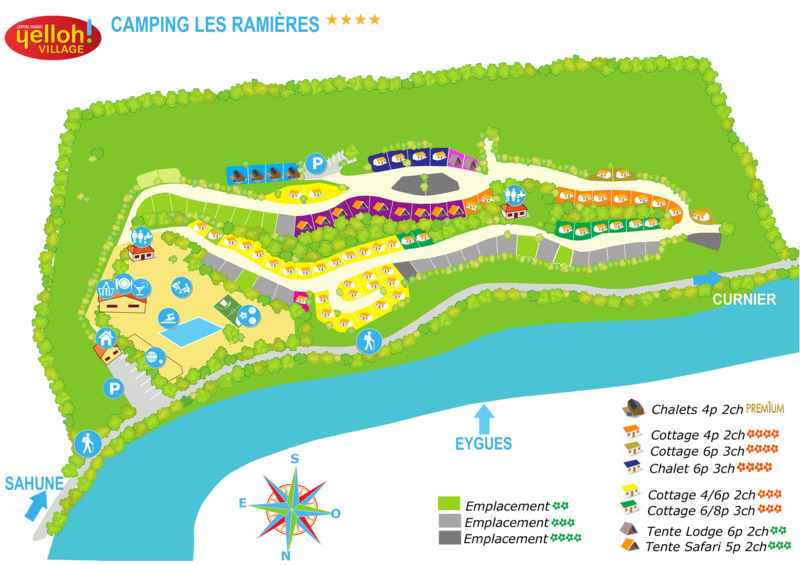 Every day, you'll be able to enjoy different activities organised within the campsite. Olympiads, fêtes, sports entertainment etc. There'll be something for everyone! Take your neighbours on with a pétanque or table tennis tournament! And while you're doing so, your children will be able to play in the campsite's games area or enjoy the coolness of the aquatic park. Set off to explore the region via the various hiking trails which leave from the campsite. You really will be enjoying the great outdoors during your next holiday at the Yelloh! Village Les Ramières. Set off to explore the surrounding region! People who enjoy a few thrills 'n spills will also be able to have a go at hang-gliding, via ferrata, adventure tree-climbing or climbing, while foodies may be tempted to visit Montelimar to taste some nougat. Your children, meanwhile, are bound to want to stop off at the crocodile farm, which is home to more than 400 species of animal, including crocodiles, tortoises and lizards, so it's a place that people love to visit!